Namespro.ca Review 2019: Is Namespro.ca a Good Hosting? For straightforward, high-quality Linux or Windows shared web hosting in Canada, the CIRA-accredited Namespro.ca is a superb hosting provider with a long and trusted track record. 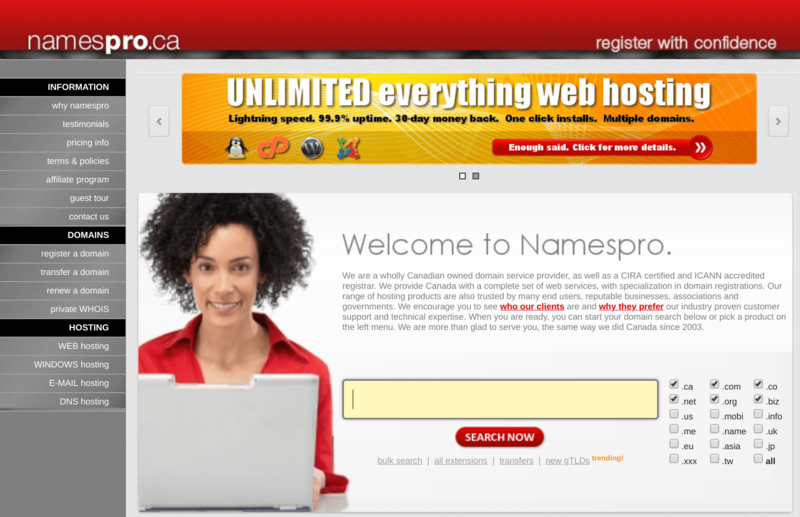 Founded in 2003, Namespro.ca is a Canadian owned, CIRA accredited hosting provider with rock-solid credentials. Although they only provide shared web hosting products, they put everything into making these products as high-quality as possible with useful software, great customer service, and a range of value-added services. Namespro.ca makes it easy for almost anyone to purchase and set up a hosting solution with one-click installation of hundreds of hosting applications. The only downsides are the dated website and relative lack of CMS-specific hosting solutions. The great news is that you can try Namespro.ca relatively risk-free thanks to their 30-day money back guarantee. While they only offer shared web hosting on Linux or Windows, you can purchase additional value-added services such as email storage, DNS hosting, and private WHOIS. Namespro products are priced at very affordable rates for the industry, especially if you consider the unlimited Linux hosting features and the decent limits for the Windows hosting. You can add unique IPs for SSL, advanced mailing lists, or database storage. All hosting plans come with 24/7/365 one-to-one technical support, which you can access via multiple ticket and email channels. Support staff are very helpful, but response times can vary, and you can only use the phone support line to report abuse! The knowledge base is good but not great. Namespro.ca’s shared web hosting products come with great out-of-the-box features and handy additional services that you can use to tailor a solution to your needs. It’s just a pity they don’t offer a wider range of hosting options. Wondering how Namespro.ca stacks up against other Web Hosting companies? Enter any other Web Hosting company and we will give you a side-by-side comparison.